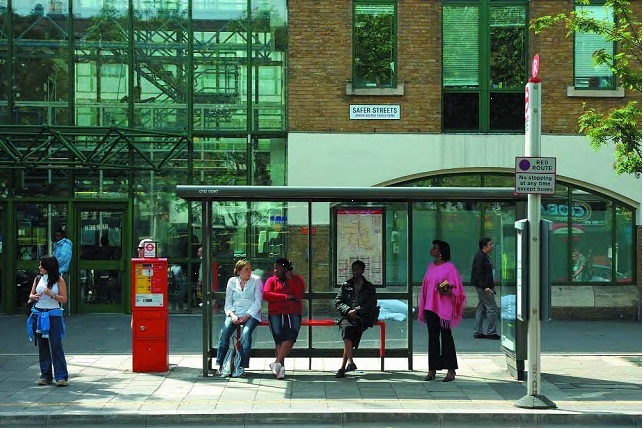 Enhanced bus stop in London (Source: Transport for London, Accessible Bus Stop Design, 2006). 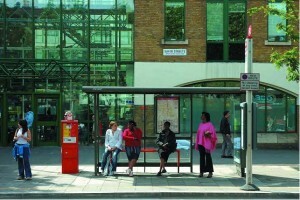 The design and location of public transport stops requires balancing many competing needs. On the strategic level more stops = more accessibility, but also means higher costs and slower trips. On the detailed level placing a stop in a crowded downtown environment means trade-offs between customer destinations and available space. This page outlines the main trade-offs for these two system design elements. More information is available on the Public Transport Best Practices wiki. The trade-off between public transport accessibility and efficiency is most clearly illustrated in stop spacing. Getting stop spacing right is difficult because no one wants to lose ‘their’ stop. Public transport stops should be spaced close enough together so that people can reach them easily, but far enough apart so that the public transport vehicle doesn’t waste time continually stopping and starting. It’s a delicate balance that needs to be carefully planned for specific situations, but in almost all cases public transport stops are located too close together. Here’s an excellent Streetfilms.org video (Making Muni Faster …) describing how consolidating bus stops can help improve the efficiency of public transport service in San Francisco. The specific location of stops on the street has a huge impact on the speed of public transport. Speed is critical because the faster the bus or tram goes the more attractive it is to passengers and the more efficient it is to operate. In short, a win-win for passengers and operators. Relocate stops to reduce the impact of local traffic congestion on public transport; a specific consideration is the question of near-side or far side stop location. Reduce the number of stops (described above). It’s also important to remember that public transport is only one part of a sustainable transport system: to be successful it must be supported by complimentary modes: walking, biking and more sustainable automobile use. This means it is important to work closely with traffic engineers to create streets designed to optimize the operation of all sustainable transport modes. A good example of this process would be redesign of a length of street. 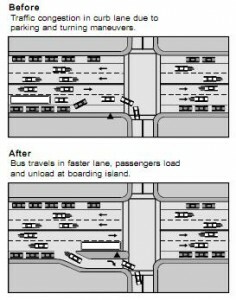 Transport planners and engineers would work together with the public in developing a design that reduces the number of stops, places the stops in locations where they are not impacted by other traffic and constructs the appropriate improvements (operational – e.g. bus bulbs – and amenities – e.g. shelters and real time information displays). Sidewalks would be improved to encourage walking (helping mitigate the reduction of stops) and bike routes would be developed to encourage biking and reduce the impact of bikes on pedestrians and traffic. The BusMeister game (and future enhancements) along with this Best Practices Library are designed to help citizens play a more central role in this type of comprehensive planning process. More detailed information about public transport stop location and design is available on the best practices wiki.